Varying the classification from member state to member state would be a significant limitation on the label. Using the common A to G level, of course, it is easier to reach the A level in warmer climates, but at the same time the energy saving potential is lower. This means for example that a lower insulation level is sufficient in Portugal to reach class A, which is well in line with the economical feasibility : as a higher insulation thickness would not be economical if the heating load is low. Today, member states have developed their own implementation scheme for the EBPD, so they introduced a country (or even region) specific classification scheme. We plan to replace the Display® classification on the Display® poster by the national classification scheme (as done in France) or in countries that use asset rating both labels can put up in parallel, as they are not directly comparable. Is collective membership possible ? Who can participate in the Display® Campaign ? Can I see who is already a member of the Display® Campaign ? What do I need to do to join Display® ? How much is the membership fee ? How is the Display® fee calculated ? What are the benefits of joining the Display® campaign ? How can Display help me with my communication campaign? What commitments do members enter into ? Are Display members obliged to display the poster if the classification indicates a poor rating (e.g. F or G) ? Can Display® replace my National certificate ? Which tools are provided by the display Campaign ? Is it possible to try out the Display® poster generation tool free of charge before becoming a participant ? Which methodology does the Display software use ? What data are necessary to create an individual Display® poster ? Which building types does the Display® tool take into account ? 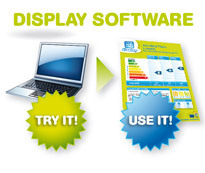 In which languages is the Display® software available ? How much time does it take to create an individual Display® poster ? 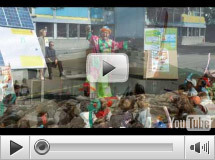 Do you require in depth technical knowledge to produce a Display poster ?